Главная / Художественная проза, Малая проза (рассказы, новеллы, очерки, эссе) / — в том числе по жанрам, Эссе, рассказы-впечатления и размышления / Литературный конкурс "Золотая табуретка"
Произведение представлено на конкурс литературного творчества молодежи, организованный в 2009 году литературным клубом "Золотая Табуретка" АУЦА, ОО «Центр социальной интеграции» и электронной библиотекой "Новая литература Кыргызстана". Публикуется с разрешения оргкомитета, в соответствии с условиями конкурса. Публикуется по книге: Много языков – один мир. Литературный альманах. 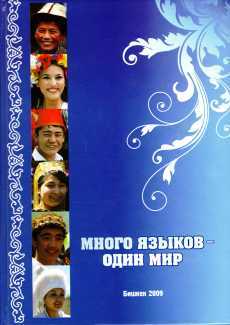 – Бишкек: 2009. – 184 с. In the pages of Kyrgyz history, we read of a time when one of our ancestors walked through burning deserts and across freezing glaciers to find a single person, in whom flows the blood of him. There were times when they killed a son for bringing filth on the pride of their blood. There were times when they were ready for their own death to not bring the people of their blood shame. But how can we describe them in this time where we live in? How can we say that they were our ancestors? Are we suitable children for that kind of great people? We do not even know our neighbors let alone our relatives. There are a lot of people among us who cannot recognize their own mother. This person who did not sleep so many nights with pleasure and fed us without demands. Sometimes I think that none of us is suitable to be called a “person”. Every animal does its job: gives milk, eggs, or meat. They do this as their duty and all of them do it for people. But what does a person do? People reject parents, do not pay attention to other people, and thinks only about themselves. How did we become like this? Is there any reason? Maybe we were friendly because we lived in socialism? To answer to this question we have to think about our current system. Democracy! What is democracy? Democracy is being free. What kind of person is considered to be free? A free person is a person who knows himself very well. Knowing oneself very well deeply depends on having a good knowledge our culture, language, and religion. These are all the things which are related to a person. When a person learns all of them very well, he will decide what kind of person to be. But who are we now? We have no idea about our culture. We cannot speak in our own language and we do not behave according to our religion. So, we are not free, we are slaves! We are slaves of our wrong ideas. We are slaves of our wrong beliefs and we are slaves of our temptations! And this slavery does not let us to be tolerance and help ourselves and other people, this slavery makes us to live in suspect and we are not able to welcome other people, we cannot trust them. Our duty as people is to abolish this slavery and let peace live among us. Just trust other people, help them, support them and will see the positive reflex. Because the same blood flows in you and others, doesn’t it?